It's not just Jedi that build their own lightsabers, it's Senior Visual Effects Artists too. Bradley W. Lewis is a man of many talents. Not only is he a videogame developer - currently working for BioWare Austin on Star Wars: The Old Republic - he's also an extremely talented model maker. Lewis has made a replica of Luke Skywalker's lightsaber from Star Wars Episode IV: A New Hope in his spare time that is simply astounding. With the aim of being more true to the movies than Hasbro's Force FX sabers, Lewis has tried to use the same parts used by the original Star Wars prop designers. His saber is built out of old camera parts, brass sheeting, and parts salvaged from clocks and hard drives, with some electronics thrown in for the noises and the glow. 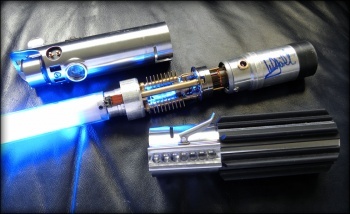 Lewis said his saber is brighter and louder than a Force FX saber, and from the pictures, it's easy to believe. If you visit Lewis's site - and I whole-heartedly recommend that you do - you can see pictures spanning the entirety of the three month build. The saber is painstakingly intricate, and if you're at all interested in prop-making or Star Wars, you'll likely appreciate the artistry of it.